Some people think that the macOS environment is not attacked by viruses. Unfortunately, this is not true and it is preferable to have a good security suite to surf the Internet. 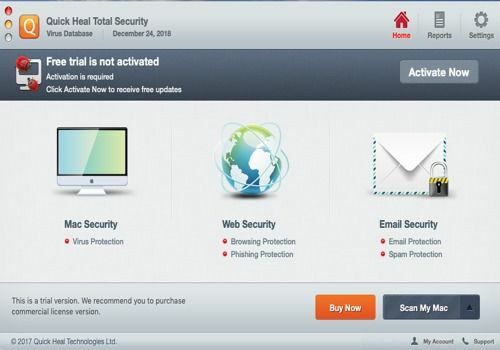 Quick Heal Total Security for Mac is one of the security solutions available on the market. It consists of several tools that will protect you in many ways. First of all, Quick Heal offers an antivirus program that scans your machine and the files you download. If it detects a suspicious element, it is neutralized and sent to a quarantine zone. Quick Heal Total Security for Mac also highlights its web protection. It consists of a navigation shield supported by an anti-phishing filter. The software also has email protection, very useful to prevent spam and emails containing infected files. Quick Heal Total Security for Mac is available in a trial version to allow you to check its effectiveness before purchasing it. It is compatible with the latest versions of macOS. The security software company offers advanced protection for Mac machines. Avira Free Mac Security is the ideal security solution for all Mac users. Totally free, it protects your system against viruses and malware, and protects your machine from phishing attempts. Kaspersky Internet Security for Mac is the essential security suite to protect your Mac from cyber threats. It includes real-time protection, a virtual keyboard, and a powerful and fully customizable parental control. Take advantage of ESET Cybersecurity Pro's complete set of protections to stay safe online and offline. Thanks to this version, your surfing on the Internet is totally protected and is done without any slowdown. Comodo Antivirus is a free software that has nothing to envy to the commercial antiviruses on the market. It offers complete protection against viruses, worms and Trojans on Mac OSX.